Visiting County Longford? This part of the Irish Province of Leinster has a number of attractions you will not want to miss as well as some interesting sights that are slightly off the beaten path. So, why not take your time and spend a day or two in Longford when visiting Ireland? From the literary connections of Edgeworthstown to the windows of Harry Clarke, here are some ideas for what know about and how to experience County Longford. The Irish name of County Longford is Contae an Longfort (note the minor spelling variant) - this name derives from the Viking word for a safe harbor, a "Stronghold" or "Fortified House". Car registrations issued in County Longford bear the letters LD on the license plate. The county town is Longford Town, other towns of regional importance are Ballymahon, Edgeworthstown, and Granard. The size of County Longford is given as 421 square miles (1,034 square kilometers) in surveys. County Longford's number of inhabitants was counted as 40,873 in the census of 2016. There is room for more, Longford has a high number of "Ghost Estates"
A common nickname for County Longford is "O’Farrell County" - identifying the local big-wigs of old. Players from Longford are known as "the Slashers" in GAA circles - denoting their successful, if rather messy, technique on the playing field. St. Mel's Cathedral in Longford Town is a massive, architecturally interesting creation. While it may not be classically beautiful, it is certainly an intriguing building that is well worth admiring. What makes it interesting is the view not from, but of its windows. Some fine stained glass works by Irish artist Harry Clarke grace the cathedral. Unfortunately, the building went up in flames on Christmas 2009, but the windows survived and restoration work is ongoing. Edgeworthstown has a picturesque main street and a bypass which is graced by a fine statue of Maria Edgeworth, selecting some reading material from a bookshelf. The writer was born here and held court for the literary luminaries of her time. None less than Sir Walter Scott and William Wordsworth followed her call into the Longford backwater for good company and even better conversation. Today, Edgeworthstown does not seem to exploit the connection to Maria Edgeworth quite as much as it maybe could. Oliver Goldsmith (born in the Longford village of Pallas) is a more obvious presence, with signposts in the vicinity highlighting parts of "Goldsmith County", extending through parts of Longford. The Corlea Trackway is an Iron Age trackway (known in Irish as a “togher”) that seems to cross a bog in County Longford near the village of Kenagh, west of Edgeworthstown. Also known locally as the “Danes' Road”, it has no connection to Danish Vikings and no real connection to a discernible road network. It remains mysterious enough to encourage speculation despite the very good visitor center. While working on the Corlea Bog, archaeologists discovered no less than 108 "toghers” or causeways. Another 76 were identified on (or in) the Derryoghil bog just to the north. Most were made from simple woven hurdles, easily built and allowing people to cross the bog on foot. When you drive through County Longford, you will see desolate, brown areas left and right of the (often raised) roads - these are bogs that are being exploited for turf, some with massive machinery. Have a look, if you can safely park. Mammoth tractors towing milling machines, tiny narrow-gauge railways crisscrossing the wastes. And always that dusty feeling. Jump up and down on the exposed and dry parts of the bog. If you do, you will feel how it seems to spring back and cushion you. Just don't go too far, do not get lost or in the way of machinery. And never, ever use an open fire (of carelessly flick a cigarette end away) on the bog. 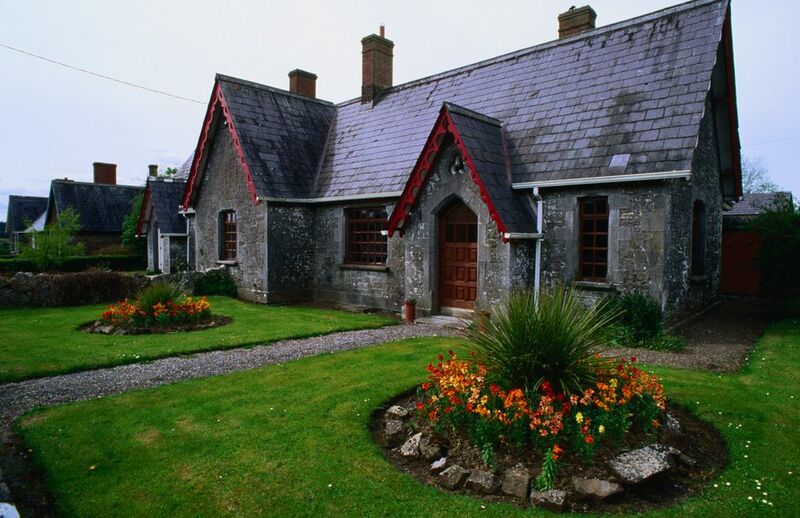 Not more than a small village, Ardagh is often ranked amongst the most picturesque little settlements in Ireland. Clustering around the compact "green", the whole village was basically created as accommodation for the servants and employees of a local landowner. The landlord in question had his own ideas on building styles and instead of embracing Irish architecture, he modeled his village on English and Cornish prototypes. Ardagh is maybe the most "English" of all Irish villages due to this quirk. Visiting County Longford and looking for a traditional activity in the evening? Well, you could do worse than head out into a local pub (which, by default, will be an "original Irish pub") and then join a traditional Irish music session. Why not give it a try? Longford Town - "Tally Ho"